The ActiveWave wristbandTag is the size of a wristwatch, yet much lighter. This tag is designed to be worn around the wrist. The wristband is secured such that if it is unfastened or cut, then the tag will immediately send an alarm to the system. 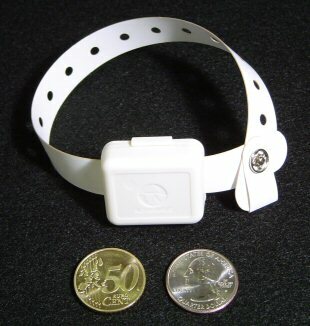 The wristbandTag can be used to track people and monitor assets in an office, warehouse, or any other type of facility. For example, wristbandTags can be configured to monitor newborns in a hospital, track Alzheimers patients in a nursing home, or even locate firemen in a smoke-filled building - basically any application that requires system monitoring of people. Wristbandtags can even be used to monitor inventory items by attaching around the arms of chairs, the handles of a car, etc. When miniTags are used on both people and equipment, then all movement of valuable assets without an assigned owner will generate system alarms and can securely lock exit doors. Typically, the wristbandTag remains in sleep mode until it receives a wake up command from an ActiveWave Reader or Field Generator. If the command is intended for this tag (specific address or broadcast), then the tag will awaken and transmit its ID and other information to an assigned system Reader. Several wristbandTag versions are available, each supporting a wake up frequency of 433 MHz and transmit frequency of 916 or 868 MHz. An optional temperature sensor can send periodic temperature readings to the system. When the temperature of a tagged item exceeds predefined thresholds, the tag automatically sends alarms to the system. Other wristbandTag options include an LED, tamper switch, and various amounts of user memory ranging from 0 to 256Kbits. Even more peripheral options may be added to satisfy your application needs.